The heat wave has momentarily broken, but I'm still using an air conditioner to pretend it's fall. Brr! says nighttime Emily, as she snuggles up to her nothing. I wonder if we'll get a thunderstorm! And just like clockwork, like fate, nighttime Emily turns up her Spotify thunderstorm sound effects station. 2012 was the last time I lived in an autumn-friendly climate. It was also a special time because I had just experienced incredibly invasive jaw surgery to fix an underbite. I recovered at my parents' house, where I watched a lot of Roseanne and didn't eat solid foods. I had a lot of down time to literally watch the leaves change. A few weeks after surgery, I had enough of being cooped up and pleaded with my then-boyfriend to take me to a corn maze. Sure, I was on some painkillers (but not many, because they cut all of the nerves in my face so I couldn't feel anything and still kind of can't in some places!). My face was puffy, I couldn't control my saliva output. If someone bumped my face, my face could fall apart. But I was going to make it work. The morning of The Outing, I woke up with hives all over my body. No problem! I'm sure a shower-in-which-I-don't-get-my-face-wet will solve it! When it didn't, my dad made me call the insurance nurse line. My first question after describing this rash that was now moving incrementally down my body like a high school boy who was about to get lucky: "Can I still go to a corn maze?" She didn't recommend it, but she did recommend I stop taking the antibiotics that I was told to finish no matter what. It was bright. It was hot. I wasn't used to navigating. My face felt heavy. I got lost in the corn and the dry husks were like pins-and-needles knives on my face. My pores started seeping some kind of liquid I was later told was the steroids leaving my body, like some slow-moving, dermatological exorcism. Kids stared as I lumbered through the corn, groaning, leaking from my face, my adult braces shimmering in the sun. My boyfriend was super into all of it, I'm sure. He took this picture. 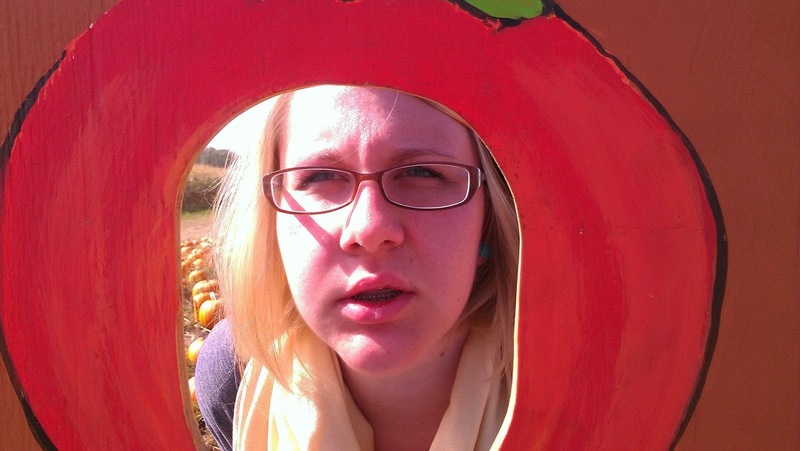 I'm going home in a few weeks, and I plan to go to an apple orchard because my face has healed and I love fall. It may or may not have a corn maze, but I'm feeling very "been there, done that" about corn mazes. 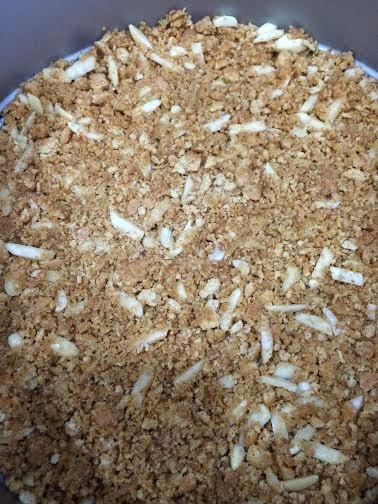 This past Sunday, I made an apple cake with apples I bought from a grocery store. This is fine, but I urge you to plan a small autumn excursion with your now-boyfriend or other companion and pick your own damn apples. Enjoy the crisp breeze on your healthy face. Make a day of it! Then, come home and make this incredibly easy apple cake! 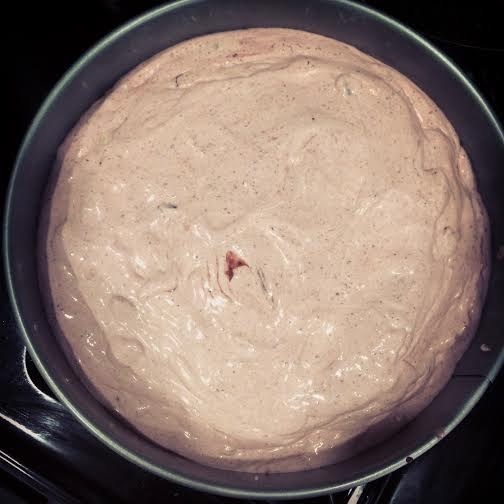 Preheat the oven to 350 degrees and grease a 13x9 cake pan. Chop up the apples and start sweating because the oven is on and you're chopping so aggressively. Bowl with feminist you-can-do-it sayings optional. In a medium bowl, combine the flour, baking powder, salt, nutmeg, cinnamon, and baking soda. Using your standing mixer... get the butter going, adding the sugar a little bit at a time. When this turns to a lovely paste, add the dry ingredients from the medium bowl. Gaze in admiration as your standing mixer really goes to town on the batter. The batter will be thick, but that's no problem for your gorgeous standing mixer. That's it. Make love to that batter. In a small saucepan, melt the butter with the sugar, brown sugar, and whipping cream. When it has turned into a sauce, add the vanilla. Be super proud because you just made CARAMEL. Also, repeat in the morning, as a breakfast cake, because it can totally be a "breakfast cake," if that's your thing. This cake was made with love while blasting/belting 90s country sensations, without shame. It was the best way to spend a Sunday afternoon. Way better than a corn maze. It's hot. Maybe it's because I come from a place where analyzing/predicting/complaining about the weather is expected and encouraged, but the heat is the number one thing I've talked about with strangers this week. And I've talked to a lot of strangers this week. What? I'm friendly/make questionable social decisions. Feeling extra complain-y about something I can't control isn't new, but lately, I've been trying to edit my inner monologues and force some good, old fashioned positivity into my head-space. That's theoretically great. But... honestly, I feel like a rotisserie chicken at a second-rate grocery store that's been left unattended and I'm just stuck on a spit as it gets hotter and hotter because a deli worker went on their break and forgot about me. And, like, I'm simultaneously running errands. Perhaps I'd be less obsessed if it wasn't technically, basically fall. The rest of the country gets to luxuriously settle into scarves and cold rain and excessive Nick Drake the words "crisp" and "autumnal" -- I don't even like pumpkin spice lattes, but I can appreciate the idea of them. The other night, I had a dream where I was wearing boots and walking on crunchy leaves. THAT WAS THE WHOLE DREAM. And I woke up feeling satisfied. Inappropriately satisfied. ...I'm also single. Anyway, the point is, it was over 100 degrees last Sunday and there was no way my roommates were going to let me turn on the oven. 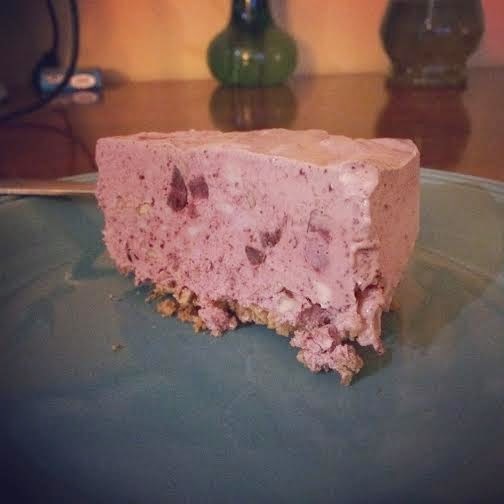 So, I found a great icebox cheesecake recipe, did some modifying, and stuck that puppy in the freezer for 5 hours. For the first time in my life, I was jealous of a cheesecake. ...I'm also single. Before you start, make sure the cream cheese is soft and the Cool Whip has had time to thaw in the fridge. You can also let the cherries thaw slightly. No, those cherries aren't moldy. They're frozen! Crush the graham crackers. You can do this with a food processor or using the Emily Schmidt Feel-Good No-Stress Method -- throw them in a plastic bag and really go to town with your fist. Don't break the bag. Add the 1/4 cup almonds to the graham cracker bits and slowly sprinkle the mixture into the melted butter. Cover the bottom of a springform pan with the crust mixture. Use a fork to press the crust so that it's even and covering the entire pan. Don't freak out if you think, This can't be a stable crust! Because you're going to freeze it and just calm down, okay? Make it look exactly like this. Chop 1 cup of the cherries into fourths (no need to be perfect) and set aside. I'm so impressed I didn't straight-up eat these. 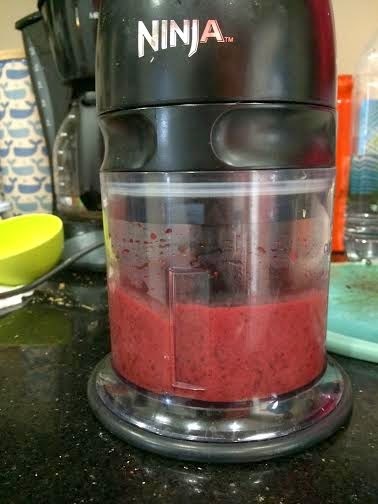 Blend the rest of the cherries in a blender or juicer. No blender? No juicer? No Ninja? Get creative. As long as you end up with cherry juice, no one gets to ask questions. Using a hand mixer or your god-given muscle, combine the sugar and cream cheese in a large mixing bowl. 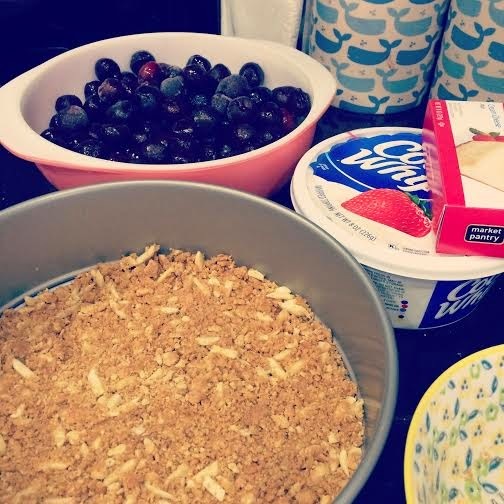 Add the cherry juice to the sugar/cream cheese, as well as the Cool Whip, 1/2 cup almonds, and chopped cherries. Mix well! ...Mix well and enjoy this fun texture (you'll know what I mean). The hard part is almost over! Attempt to secure cling-wrap on the top of the pan. Realize the cling-wrap doesn't stick to the pan. 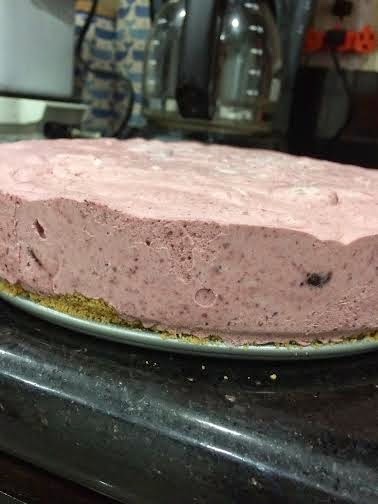 Carefully put the cheesecake in the freezer for 5+ hours. Make sure your roommates know to be careful when opening the freezer for the next 5+ hours. Thanks for visual perfection, springform pan! While technically cheesecake, the Cool Whip is definitely a present flavor, so keep that in mind if you hate Cool Whip. 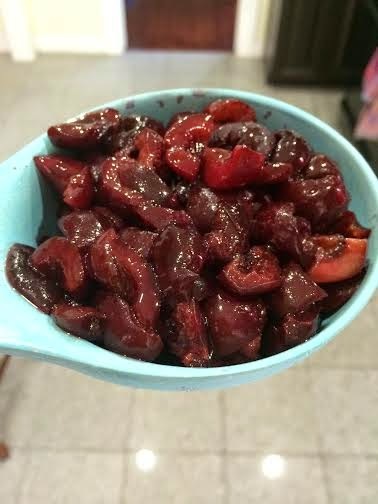 Also, feel free to sub fresh cherries for frozen -- to find out if it's cherry season, go to three grocery stores before realizing it must not be cherry season. This cool treat is also delicious and pretty. I mean, it's just so pink, you know?! It almost made me forget that it's 100 degrees outside. Almost. Almost. Welcome to my one millionth blog! Thanks for being here. I'm a writer and improviser living in Los Angeles, as well as a TV lover and documentary watcher and recreational baker who is prettttttty Minnesotan. The bundt pan and I were born in the same city. It's in my blood. This blog will feature recipes that I've modified/tried -- I'll link to wherever I found the initial recipe, when possible. I bake most every Sunday because it seems like a good day to do that, and I typically have improv rehearsal, so I can force friends to try what I've made. I don't usually substitute with lighter options, because if you're going to have dessert, just have dessert, you know? I could never really talk about baking without talking about my grandma, so, just let it happen. My mom is not a baker (sorry, Mom, but you're so many other things). My late grandma Robinson, though, continues to be the best cook/baker I've ever had the pleasure of knowing and her kitchen was a living organism that never took a break. Either the counters were filled with half-chopped ingredients while something delicious bubbled on the stove or the dishwasher hummed diligently, replacing the smells of rib roast and oatmeal cookies with Dawn detergent. I sometimes got to help her in the kitchen, but it was her domain, and she usually preferred everyone leave her alone and enjoy happy hour rum & Diets in the den (I stuck to caffeine-free Diet Pepsi). There was one treat she made just for me. Whenever we visited, I knew I could open the fridge to find glass Skippy jars filled with homemade tapioca pudding dyed pink. I haven't gotten around to making it myself because it feels like Grandma's secret -- the worn recipe card featuring her familiar, no-nonsense shorthand. She loved cooking and baking for the people she loved. 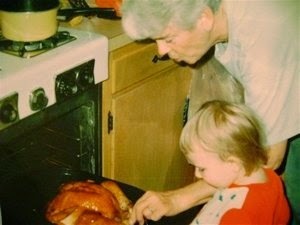 And I know she loved cooking and baking for herself because she would sing along to 1940s crooners and Patsy Cline. I think of her a lot when I'm in my own kitchen. My mom didn't have the luxury of baking because I grew up in one of those over-scheduled households where the four of us were all going in different directions, forever double-booked and about to lose our minds. It was the best childhood because I learned how to embrace stress and multitask like a motherf*cker. It was the best/worst childhood because I got to eat a lot of McDonalds. So, when it was time for my mom to contribute to some god-forsaken dessert table at some potluck event my dad forgot to tell her he volunteered her for, painstakingly making something from scratch wasn't high on her list of priorities -- mostly because it's hard to bake while driving a GMC Safari van across town. She had one sure-fire, never-fail recipe. Pat Schmidt's Oven Opus: The Chocolate Chip Bundt. It's a magical cake that can go from ingredients to oven in under five minutes. And it tastes complicated. People are always impressed. Growing up, the cake felt like a well-kept secret -- the trick of an over-worked mom. Now, I make it when I promised a bundt, but I'd rather take a nap. I'm at a different place in my life, okay? 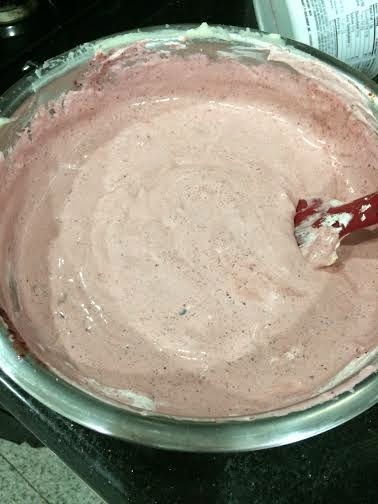 In a large bowl, combine the dry cake mix, dry pudding mix, eggs, oil, water and sour cream until well blended. Cool upright for 15 minutes. FLIP IT AND PRAY FOR A CLEAN RELEASE. Dust with powdered sugar, if you're feeling fancy. If you've made a bundt, you have probably felt a kaleidoscope of emotions. They can be some of the easiest cakes to make, and for some reason, people think they look "fancy" -- because of their shape and hole?? Sure. But it all comes down to that flip -- and if you're a hasty greaser or you haven't given it enough time to cool, you're going to be sad. Patience is a virtue. Be liberal with the PAM. If you're still unsure pre-flip (and who isn't), you can slide a butter knife along the edges of the pan to loosen the cake. Be gentle. There's nothing you can do for the bottom-that-becomes-the-top. When you flip it onto a plate, if you don't feel it release right away, you can tap the bottom of the pan with your palm to ease it out. Don't break your plate doing this. At the end of the day, if your bundt breaks (attention: metaphor applicable), the ingredients are all delicious, and the cake will still taste good, and that's what matters.